Here’s a pattern that came to reside at The Stitchery today via Ebay. I’d prefer long sleeves with elastic at the wrists. 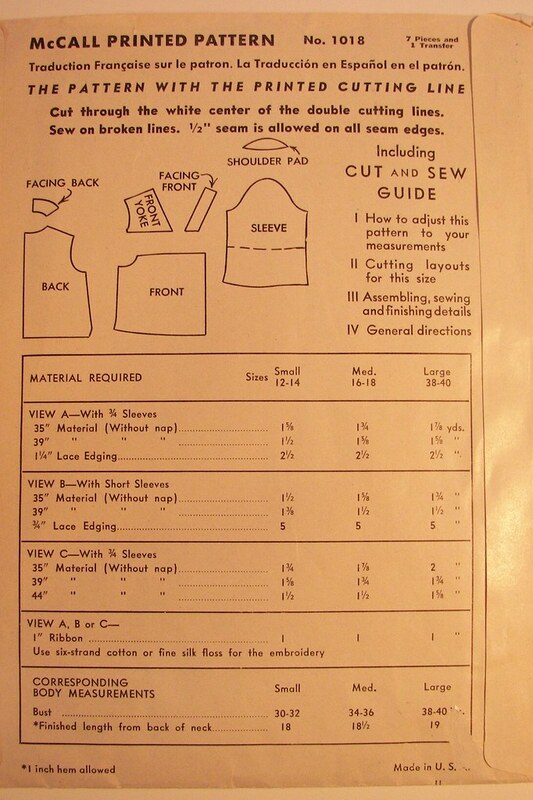 It’s an easy alteration to make given that the sleeve pattern is already shaped and not just straight. I was going to say: “When I get away from this week’s commercial work I’ll post a tutorial on lengthening and and adapting to a Bishop’s Sleeve” but I don’t know what this weekend will bring. This week has been a disaster at work and we’ll be working all this weekend. If you really want this tutorial let me know and I’ll work something up to post but I can’t promise a specific time. That’s how all summers go when you make your fabric buying money by being an educational materials manufacturer. Some months are better than others! What a sweet pattern – it doesn’t look terribly hard to adapt. Keep you chin up! In college, for a few summers, I worked in a textbook distribution warehouse packing books. I certainly remember the summer rush, long weeks and long days. That is a very elegant bed jacket indeed! Now you only need the nightie to wear underneath it! A very sweet pattern was my first thought. Yes tutorial please Mary Beth but only when you get a breather. You have a wonderful job, I love Montessori everything. My eldest went to a Montessori Kindergarten. I wished it was available for my other 2, we moved house/city/country…lol. Just saw a vintage book on the ‘bay with a bed jacket but it was knitted, can’t remember if I had it bookmarked. What a great pattern! I’m glad you were able to find one. I know that when you get the time, we will be treated to an extraordinary version of this garment. I really like this pattern, especially the fronts pleated to the yokes. I think “A thoughtful gift for new mothers” dates it a bit – new mothers aren’t expected to stay in bed very long anymore! I do remember my mother getting a bedjacket when my sister was born, but that’s a long time ago. Hope the work is going OK, and that you’ll have time to get back to your own sewing soon. I’ve been looking at this more closely, since it occurred to me that my mother might like a bedjacket for her birthday. I think I can adapt a blouse pattern to make something similar. I just read the bit about fabrics: I assume fine flannel here means wool flannel, but can anyone tell me what albatross is? I don’t think I would make it in silk or a sheer, as I’d like it to be warm as well as pretty. Albatross A Lightweight, Plain Weave Fabric Traditionally Of Wool Or Wool Blends With A Napped, Fleecy Surface . So Named Because The Texture Resembles The Breast Of An Albatross. Usually Light In Color- Used In Infant’s Wear , Sleep Wear. a.	a lightweight worsted fabric with a crepe or pebble finish. b.	a plain-weave cotton fabric with a soft nap surface. I am not sure I’ve ever seen this fabric. Thanks Mary Beth. I don’t think I’ve ever seen albatross fabric either. It sounds a bit like a pre-synthetic micro-fleece. I hope your knitting workshops were inspiring and enjoyable. my daughter is having a baby and is due August 1st. I’d love to make her a bed jacket for nursing the baby. please send the pattern! Excellent Pattern, I have been looking for a bed Jacket pattern for ages, I would love to make one for my Mum, please post a tutorial when you are not so busy. My mom is convalescing at my home and she was just asking me if I remembered the old Bed jackets (she is 79) to make a patient presentable to their guests and I didn’t. Now I can show her a picture and maybe make her one or crochet her one from a crochet pattern. This is so awesome to see the old patterns. There’s nothing better than the olden days!! I LOVE the old books of fancy work as my grandma used to say!! I don’t know why bed jackets aren’t around anymore. Think how useful they are! For example, you could make one out of lightweight polar fleece for watching TV in bed in the winter. You could make it more modern by using a big, funky button for the closure instead of a ribbon. Thanks for posting! 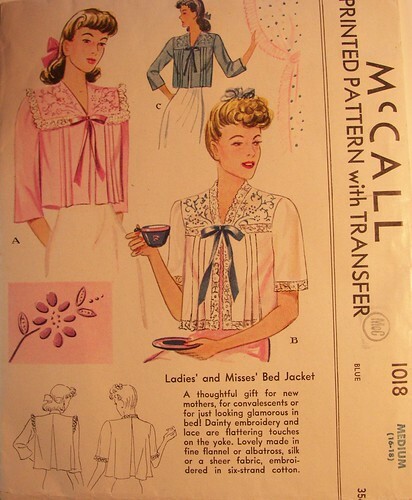 I would love this pattern, I cannot find a bed jacket pattern anywhere. This is such a pretty one. Would love to make some to give for Christmas presents. Hi Martha! I found this one on Ebay and it came without the embroidery transfer so I’m on my own with that. I have seen the same pattern a number of times for sale in used pattern shops on Etsy and Ebay since then. I hope you can find something good. But hey, look at the pattern pieces above and see if you can draft your own and make it in a knit so the sizing is more forgiving? Or modify an existing pattern with set in sleeves?